Do Antibiotics Affect Children's Sleep? A child who is ill with an infection likely needs a fair amount of rest and sleep to help her recover fully. However, it is often difficult to sleep when the infection is accompanied by uncomfortable or painful symptoms such as earache, sore throat, coughing and congestion. If your child is taking antibiotics for her illness, you might wonder if her sleep is also affected by the medication she's taking. If you have reason to suspect that antibiotics are wreaking havoc with your child’s normal sleep patterns, consult with your child's doctor before stopping the medication. Antibiotics work by killing microorganisms or preventing microorganisms from reproducing in your child's body. Doctors typically prescribe antibiotics to treat bacterial infections in children. The exact type of antibiotic treatment a doctor prescribes -- whether it be capsules, tablets, chewable tablets, liquid or pediatric drops -- depends on the age of the child. If she’s taking amoxicillin -- a drug commonly prescribed for bacterial infections in children due to its relatively pleasant taste – she’ll need to take her medicine two or three times per day for a prescribed number of days. If your child takes her medicine at appropriate intervals and for the required number of days, it will likely wipe out the infection-causing bacteria fairly quickly. Upset stomach, vomiting and diarrhea are possible side effects of amoxicillin use; contact your child’s doctor if her stomach disturbances are severe. While excessive tiredness is also a possible side effect of amoxicillin treatment, MedlinePlus notes that it is considered uncommon. 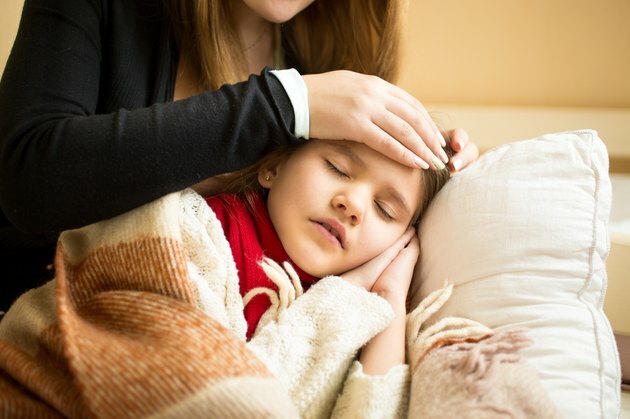 Furthermore, many of the illnesses that require antibiotics can cause your child to feel more tired or require more sleep than usual, so if your child has not yet completed a full course of antibiotics, she might feel fatigued as a result of her infection. Nevertheless, if you suspect your child’s increased need for sleep is due to her antibiotic treatment, discuss your concern with your child’s doctor. A combination of amoxicillin and clavulanate, sold under the brand name Augmentin, is used to treat bacterial infections in many different parts of the body. MayoClinic.com lists several rare sleep-related side effects of this combination including restlessness, sleeplessness and difficulty falling asleep. Such side effects do not necessarily require your doctor’s attention; they are likely to resolve on their own as your child’s body adjusts to her medication. Nevertheless, call your child's doctor if you have particular concerns and want guidance about how to improve your child’s sleep while she is taking the medication. Once your child begins antibiotic treatment, she should complete the entire course of medication. Even if you suspect her sleep patterns are being disrupted as a result of antibiotics, her doctor is likely to advise you to continue administering her medicine. The Merck Manual Online Health Handbook warns that discontinuing use of antibiotics prematurely can lead to recurrences of the infection or the development of antibiotic-resistant bacteria. If you are considering withholding her medicine for any reason, speak to your doctor.